Maths whizz Alice has already solved a mystery or two. Persuaded by wannabe sidekick Sammy to investigate a scientist’s disappearance, she’s soon entangled in her trickiest case yet. Dr Learner is reputed to have invented an invisibility suit, but is wacky science really to blame for his vanishing? 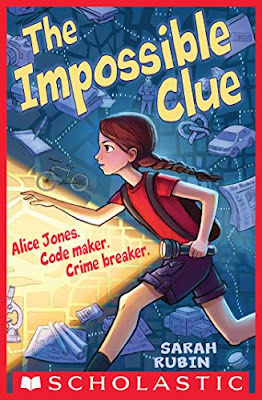 With the unlikely help of erstwhile nemesis Kevin, Alice solves the puzzle – only to face another. Should she reveal the truth, or protect her most devoted friend? The first paragraph from Sarah Rubin's The Impossible Clue about Tween Alice Jones Crime Solver grabs you. Not really a fan of mysteries but I absolutely loved this book. Alice is today's Nancy Drew. She is super smart, level headed, funny and fearless. She is the perfect role model for kids. She doesn't come off as precocious or act too mature for her age. This is the perfect heroine for today's kids. I will read every Sarah Rubin book from now on. I am a new fan! Great mystery read for kids 8-15.